My sister Andrea mentioned Taarradhin in a round-up post last October, and I finally got around to playing it. It's short, but it caused me to reflect on the role of romantic interests in dating games. Spoilers for the game follow. On your first playthough of Taarradhin, you can choose to romance either one of two new slaves in your palace or simply get to know them both a little. The mechanic for choosing has a satisfying logic; if you choose to talk to one of them twice in a row, you're romancing them. In the end, it turns out the slaves were meant to be as a sacrifice to the goddess to petition for rain. You can save the one you romance but there's a feeling of incompleteness. Since the two romance-able characters are slaves, you get the feeling that they're slightly distant from you and trying to please you, even after a "happy" ending with them. Often in dating games, each new character provides an exciting opportunity to woo and "win over." But the "true ending" in Taarradhin doesn't have you marrying anyone. The "true ending" only unlocks after you've seen the other endings, as if you, the player, needed to get your selfish romancing desires out of the way before you could start to care about the characters on a deeper level. It's only in the final ending that your player-character really gets to know the two strangers and starts to change her own ideas about the world, shedding some of her entitlement and ignorance (but still retaining her youthful charm). She feels enough compassion to offer herself as a sacrifice in place of her slaves, and subsequently free them. It's much more satisfying than the romantic endings. Because while being married to royalty sounds like a nice life, it would be even nicer to choose one's own path. 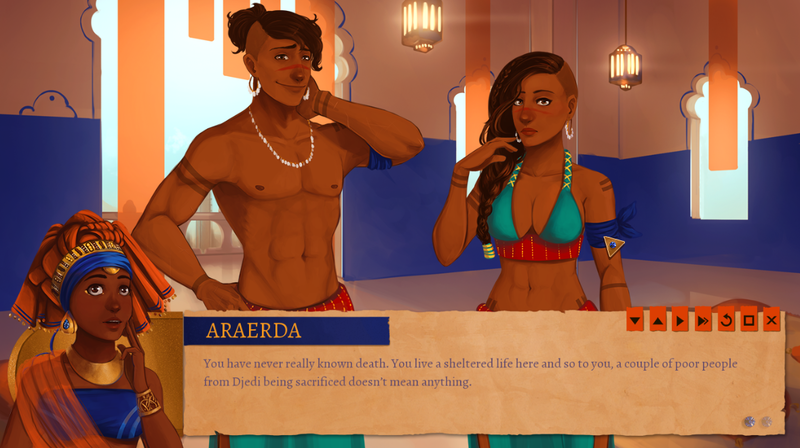 I feel like this game caught me objectifying their characters and then gently reminded me that even handsome and beautiful people have their own hardships. Sure, if I'd had the option to talk to them more in the first playthrough, I would have done it then. 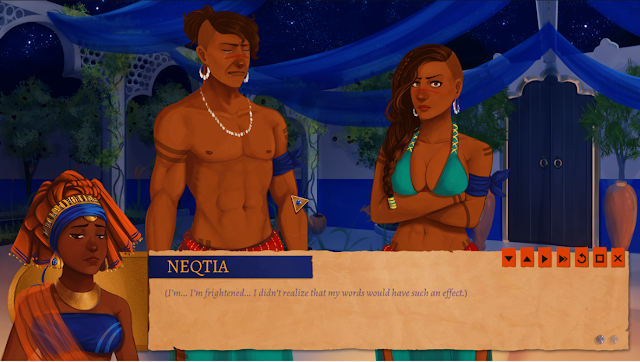 But because of how the developers unveiled the information, it made me reflect on how I'm sometimes like Neqtia, blissfully unaware in my own little world and just seeing others as a means to achieve my own goals.